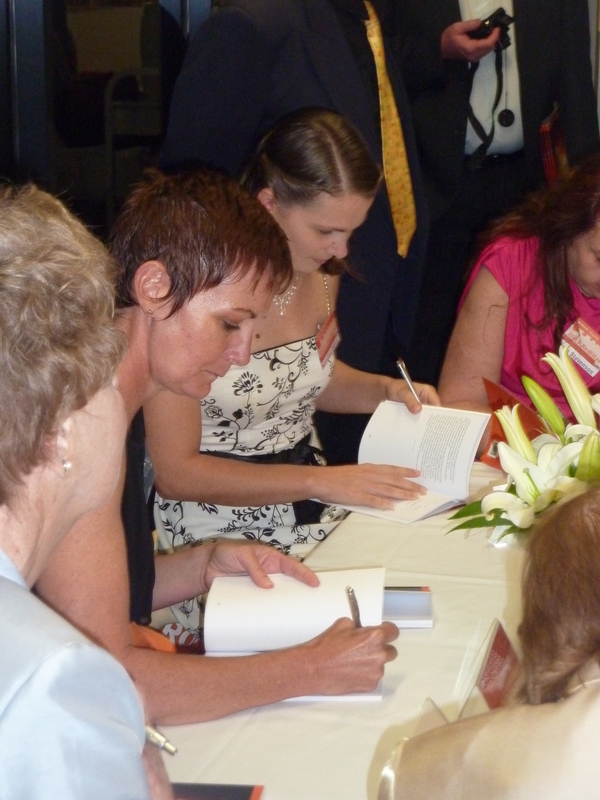 I already loved the Redland City Council for having the Redlitzer and giving me a chance to become officially published, then I loved them even more for the awesome day they gave the winners with Angela Slatter, Louise Cusack, Marianne De Pierres and Rowena Cory Daniells where they mentored us. Now, after the Gala Event I’m not sure if I can take it anymore! Last night was fabulous. They had sushi and gyoza (mmmm, gyoza) among the hors d’oeuvres (so naturally I kept attacking those plates, scaring the poor library crew carrying them), all the beverages were non-alcoholic (perfect for me since I can’t have alcohol anyway), and the centerpieces on the tables and stage were gorgeous. I would have taken more photos, but a lack of baby sitters meant Xander came with us so T-J’s hands were usually full of wild toddler and I was too often engaged in conversation(or nabbing more gyoza) or signing my book (squeee!). The official awards ceremony was kicked off by the Mayor and each of the mentoring authors stood up for their own short speeches commending and further mentoring the writers. The awards were handed out – actual trophies, big gold star trophies, they are immensely cool but I can’t seem to take a good photo of mine. I’m hoping the professional photos will have a shot of them that I can share with you all. The Editor’s Choice was selected and Margaret Dakin’s amazing story won it(I know what it’s about, but haven’t read it yet, I can’t wait to!). The Gala Event was also the inaugural launch of the Junior Redlitzer anthology. 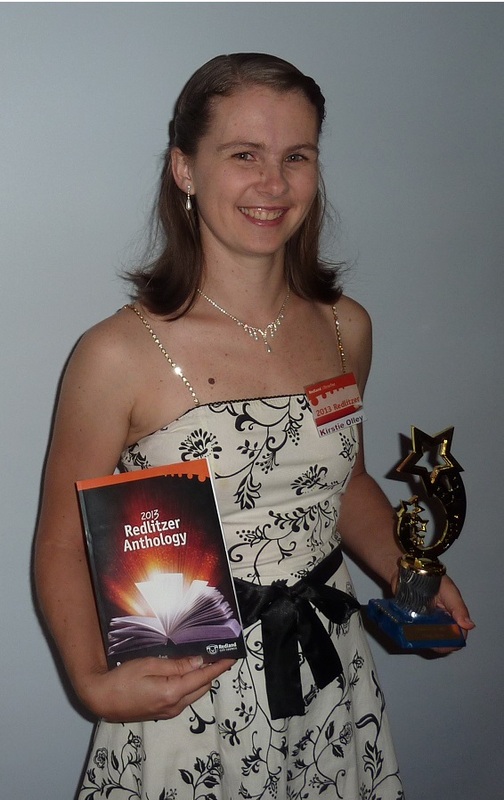 In previous years the Redlitzer has had only teen and adult categories and they share the same anthology pages, but a junior category was added this year. Peter Matheson and Angela Sunde were their mentors and Peter Matheson had a hilarious speech praising the young writers and warning us older ones to watch out, because “those hoofbeats you hear – that’s them about to charge past you”. It makes me keen to actually go read the Junior anthology too. With the awards over it was time to go to the signing tables. There was plenty of book swapping among the authors as we gathered up signatures for our own copies, but there were some legitimate signings too. It was very exciting taking my new signature out for it’s first spin and I only mucked up the ‘y’s swirl once. All up it was a fabulous and fun night, with yummy food gorgeous decorations and lots and lots of love for the arts and reading. I want to thank our Mayor, Karen Williams, and Redland City Council for putting so much money into the arts and this event. 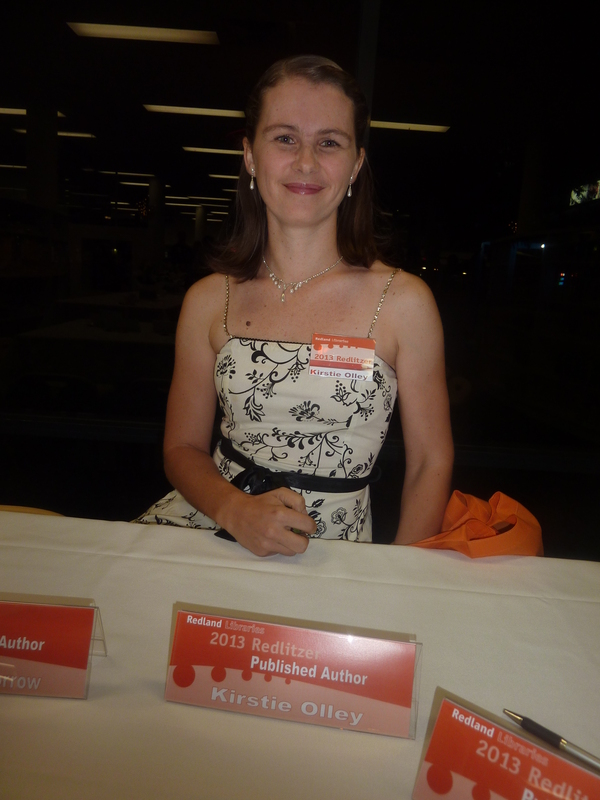 I also want to thank the Queensland Writers Centre for their support of the awards. And how could I not thank the fabulous staff at the Redlands Libraries who helped organise the event and did a lot of behind the scenes work that I know goes unnoticed most of the time. For anyone keen to nab a copy of the anthology you can buy them from any Redlands Library for $10 and plans are in the works to have them available for sale from the Angus & Robertson at Victoria Point. However if you don’t live locally there are two options for you. First up I’ll be organising a giveaway shortly so you could win a copy, or we can arrange something with Paypal and posting it out. This is Kirstie Olley, officially published author, hoping you all have a fabulous long weekend! Well done, Kirstie. What a great feeling that must have been. BTW – dress is lovely! !